Updated on 27/03/2019 with more content incl. safety advice and two-stroke vs four-stroke engine guide. We also re-visited our ‘best picks’ section, adding several new kids’ dirt bikes to the list. Enjoy! We live in times where kids can spend fun time as never before, enjoying an amazing ride on toys their parents never even dreamed of. As your kids grow up, they fall in love with scooters, pocket bikes or downsized dune buggies, to name a few. Sooner or later, your kids will want to ride. From the moment your children ask you if they can get a mini dirt bike you will most certainly have mixed feelings. Obviously, you want your child to be happy and chances are that you are as excited as your kid, or even more so! As you move forward and start to look for a perfect dirt bike for your kid, you will think about safety, compare different kids’ dirt bike types, and wonder what size of the bike you should go for. Yes, choosing the right dirt bike for kids can be tough but fortunately, you found us, and we are here to help. 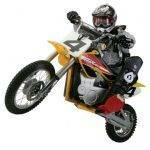 In this in-depth kids dirt bikes’ buying guide, we’ll introduce you to mini dirt bikes for children. Not only you’ll hear some good, practical tips from us but you’ll also learn what are the best bikes currently on the market, what you should pay attention to when choosing right bike and how to decide on the right size. Let’s start, shall we? Electric 350W 5 - 8 $ 4.0 Amazon Very similar to MX350 - same power & size. Different colors. Electric 250W 5-8 $$ 4.0 Amazon An alternative to Razor MX350/ MX400. Smallest engine capacity. Gas 105cc 12-16 $$$ 4.7 Amazon Best Dirt bike for 15 Year old - gas, offroad motorcycle. 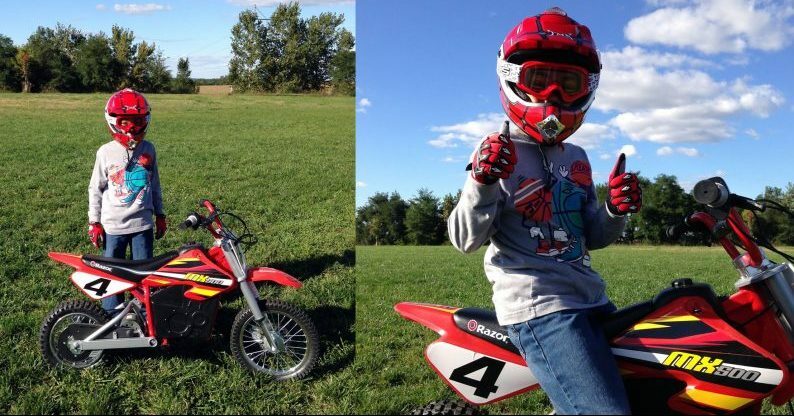 How Do Dirt Bikes for Kids Differ From Regular Dirt Bikes? Kids Dirt Bikes are generally smaller versions of the regular dirt bikes for adults. They are lightweight, easy to ride and often act as an introductory dirt bike for young children. Those small-sized entry-models for youngest children (age 3-6) typically have limited features and may be considered as ride-on toys rather than regular yet scaled-down motorcycles. For example, they feature limited or even no suspension whatsoever. Fortunately, popular dirt bikes such as the ones from Razor: MX500, MX650 or SX500 are all equipped with a dual suspension, thick tires and enough electric power to actually provide some genuine dirt bike experience for our little riders. We could say the same for the Monster Moto bikes, which are a nice hybrid between dirt bike and motorcycle. Then, there are also high-end, expensive dirt bikes that are nothing but a scaled down version of their adult-sized counterparts. Bikes like KTM 50SX Mini, Honda CRF50 or Yamaha TTR50 are all high-end, gas-powered dirt bikes that feature fully-featured suspension and all other features you’d find on their adult-sized counterparts. Kids’ bikes are smaller in actual size. For example, Razor’s MX350 dimensions are 44 x 24.5 x 31 inches whereas the Kuberg Start electric motorbike for the youngest kids features a low 16-inch seat height and less than 45 pounds in weight. Of course, there are also slightly bigger models for more grown-up kids. 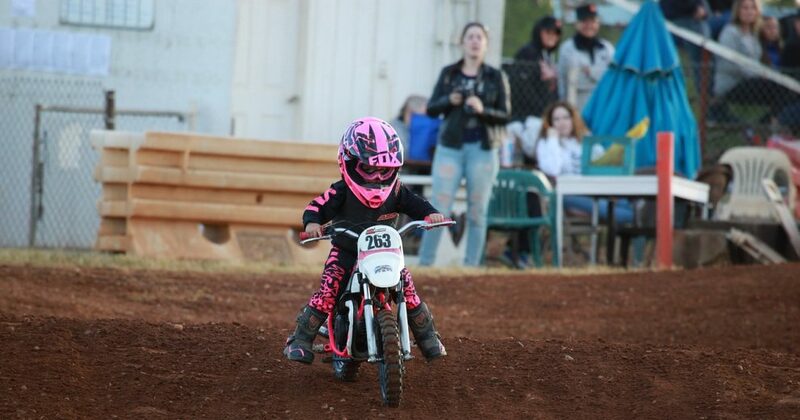 But generally mini dirt bikes for kids are much smaller than the adult models. They have small-sized engines. Until some years ago, gas powered dirt bikes were the only option available, with engines ranging from 50cc – typical for beginner riders – to stronger four-stroke engines up to 125cc for advanced riders. 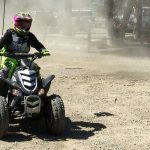 Although gas dirt bikes for kids are still in demand today, the electric dirt bikes are the ones that have been growing in popularity in recent years. Why? Due to their simplicity, silent and efficient low-maintenance operation, instant torque provided and attractive prices. Youth Dirt Bikes are not built for street use. Most bikes that you’ll find these days generally do not meet the so-called “The Federal Minimum Requirement” for on-road motorcycles that every state requires. This effectively means that most dirt bikes for kids are not street legal and can be operated only on racetracks, private roads, or within private properties. Limited suspension options. Dirt bikes aimed at children often have limited suspension options. Some models do not have suspension at all but they are typically low-cost entry models for the youngest children. Some more advanced models are equipped with both front and rear suspension. For example, popular Razor Dirt Bike features dual suspension design to ensure a smooth off-road ride. Generally, though, it’s worth to note that suspension elements in kids pit bikes are not as advanced as those seen in adult dirt bikes. Kill-Switch or/and Speed Limiter. Naturally, minibikes aimed at kids aren’t that fast like their adult-sized counterparts but even their max speed of 15 – 25 mph is fast enough to be considered too much in some circumstances. This is why, some models you’ll find – and especially those with larger sized engines – feature either an adjustable speed limiter or in some cases a kill switch which allows rider to “pull the plug” and kill the engine instantly when triggered. 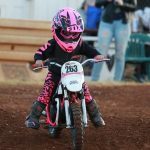 How Can Kids Benefit from Riding Youth Dirt Bikes ? 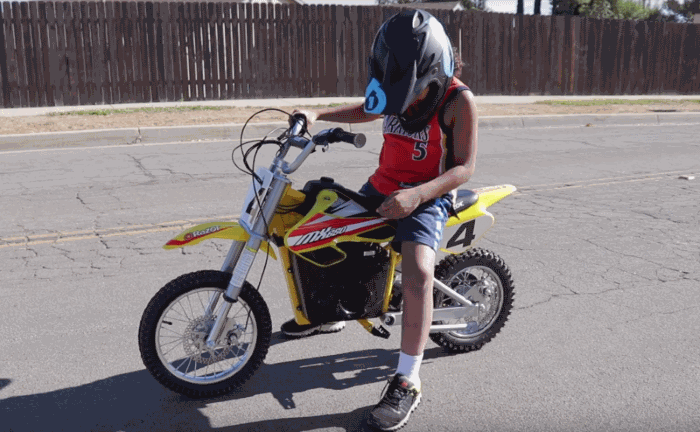 Riding youth dirt bikes is not only super fun, but it also engages children’s bodies and minds. Even more importantly, riding dirt bikes helps children develop motor skills, coordination and confidence. Kids that are physically active have stronger muscles, healthier hearts, and properly developed reflexes. Riding youth dirt bikes will definitely help young people build endurance, make them feel good, and feel happy! After all, what is more rewarding than seeing a smile on the face of a healthy child? Perhaps the best way to explain the positive effects of riding dirt bikes by kids is to look at this review from a happy customer who purchased a Kuberg Cross youth dirt bike on Amazon. Check it out, it’s worth reading. And as for the Kuberg bike itself, here’s the 2016 edition where you can learn more. How to Choose Mini Dirt Bikes for Kids? Choosing the right youth dirt bike from a variety of available models can be both fun and challenging process. It’s very important to choose wisely, especially if a young rider has never ridden a dirt bike before. 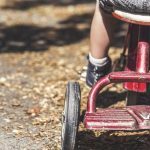 Every child is different and you know yours best, but typically most kids are ready to start riding dirt bikes when they are 3-4 years old – or when they start being able to ride a bicycle without training wheels. Although the smallest entry-bikes cost less than more “universal” kids dirt bikes, your kid will quickly outgrow a small bike. Therefore, sometimes it makes sense to invest into a larger sized dirt bike that will serve for a few years. The youth dirt bikes for beginner riders tend to have low seat heights to make kids feel in control. Such introductory dirt bikes are lightweight and nimble enough to be unintimidating, yet challenging enough that young riders won’t grow out of them before getting their money’s worth. Pay attention to bike’s weight. The lighter the dirt bike, the easier it is to ride and maneuver. 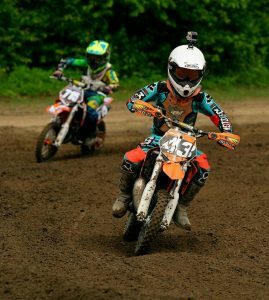 The smallest dirt bikes for the youngest riders can weigh as little as 20 pounds whereas dirt bikes for kids 7 to 14 years old can weigh anything between 60 and 120 pounds. For example, a high-end Kuberg Trial E 21-inch Dirt Bike weights less than 65 pounds which is a respectable achievement given that it is recommended for children up to 10 years old. 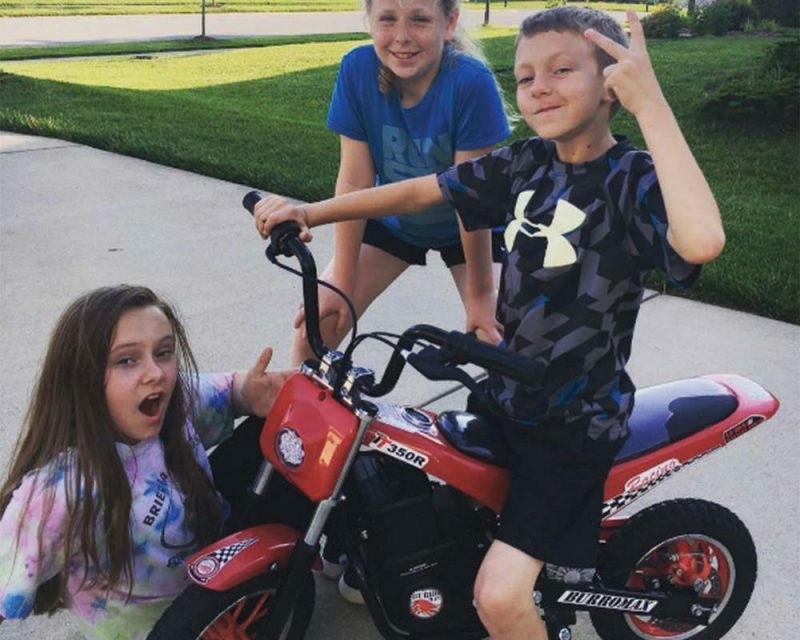 When deciding on a dirt bike to purchase for their kids these days, parents have an option that was not available years back, and that is an electric dirt bike as opposed to a gas-powered one. While some parents might initially raise their eyebrows at the thought of an electric dirt bike putting out the same kind of power as a 4 or 2-stroke gas engine, the technology behind electric dirt bikes is sophisticated. They run fast and accelerate even faster, providing plenty of joy. While it is true that gas-powered engines have a slight advantage when it comes to power, electric engines deliver instant torque and often better acceleration, required for an exciting off-road experience. Also, there are many features of an electric dirt bike that make them a better choice than gas-powered. Electric dirt bikes save money compared to gas-powered because you do not have to buy fuel. Most electric bikes are powered by high-tech lithium-ion batteries, that can be recharged from an electrical outlet and will run for long enough to make the fun last (but not for too long, so that it’s possible to get children back home for a dinner). 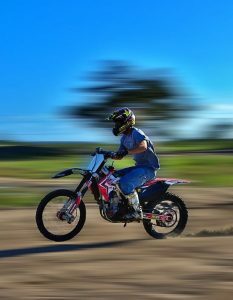 Electric dirt bikes are also a LOT quieter than their gas-powered cousins, and this means that a parent does not have to worry about the neighbors getting upset like they might when a 2-stroke dirt bike is blasting around the neighborhood trails. Some trails will not allow gas-powered dirt bikes because of the noise, but this prohibition does not typically extend to electric dirt bikes. Electric dirt bikes are also far eco-friendlier, do not leave the smoke behind and leave a far smaller carbon footprint. There won’t be any gasoline smell in the air too, and that appeals to environmentally conscious parents and kids alike. Maintenance is another area where electric dirt bikes have an advantage over gas-powered. Electric dirt bikes do not require motor oil or spark plugs and will start right up with the push of a button. Also, the engines of electric dirt bikes do not get anywhere near as hot as gas-powered, so parents do not have to worry about the burns that may result from a riding a gas-powered mini bike. Parents may also like the fact that most electric dirt bikes do not require the use of a clutch and there is no need to shift gears manually. 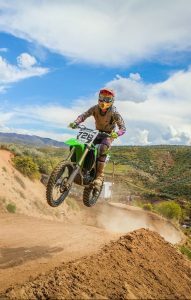 While some might say that shifting gears and using a clutch is part of the fun of riding a dirt bike, beginners may have an easier time riding electric because of this feature. The bottom line here is that when the cost of fuel, maintenance, safety, noise, and ease of use are all considered, an electric dirt bike is a much more sensible choice than a gas-powered bike. Some parents will still want their kids to ride gas-powered, and the kids themselves might feel that way, too. However, with all the advantages to an electric dirt bike, it’s hard to make an argument against them. If you prefer traditional, gas-powered engines that’s fully OK, they have undeniable advantages (including that noise!). However, as you search for a perfect bike for your child, you will most likely need to choose between a 2-stroke or a 4-stroke bike. Here’s what you should know. There is a significant difference between the two and four-stroke engines, and there are pros and cons to both types. Adult riders tend to be educated in these differences and have their personal preferences, but the question of which one is better for a kid might make a parent stop and think for a bit. The first thing to realize regarding the difference between a two-stroke engine and a four-stroke is the power versus weight ratio. What this means is that a two-stroke 125cc bike has the same amount of power as a 250cc four-stroke, but the 125cc bike is much lighter, so the 125cc delivers a lot more kick when the throttle is twisted. A 100-pound kid is going to experience a lot more pickup on an 80cc two-stroke than an 80cc four-stroke and go a lot faster, so the rider must be prepared for this and experienced enough to handle the bike. Speeds of up to 60 mph or more can be expected of an 80cc two-stroke, while an 80cc four-stroke tops out at around 50 mph. A four-stroke engine is a better choice for a beginner because it does not have the lightning-fast acceleration and is easier to handle. A four-stroke dirt bike is going to deliver a much smoother ride than its two-stroke counterpart, however. The powerband on the two-stroke means more shifting and a two-stroke is going to wear out a rider more quickly than a four-stroke, so a four-stroke is better for longer rides. When it comes to maintenance, a two-stroke dirt bike is cheaper and easier to maintain. 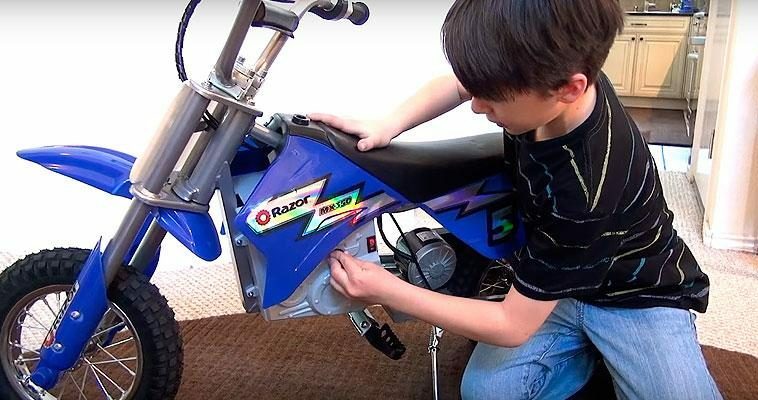 Two-stroke engines can take more of a beating than a four-stroke and are very basic to fix, so a kid is going to be able to learn how to repair and maintain a bike more easily with a two-stroke. While a four-stroke might need less maintenance in the short term, they are far costlier to repair and maintain in the long run. Four-stroke engines have more parts than a two-stroke, and the parts themselves for a four-stroke are more expensive. Also, because they are more complicated, four-stroke dirt bikes will require the services of a mechanic more often, and that adds to the expense. a two-stroke dirt bike has more pickup, is faster than a four-stroke of the same size and is easier and less expensive to repair and maintain. A two-stroke is a blast for ripping around trails with a lot of shifting and speed, so there is a more advanced skill level required than for a four-stroke. A four-stroke will be a more expensive bike to own but has a smoother ride with more gentle acceleration so that might be a better choice for a beginner. The Razor MX350 Dirt Rocket is a miniature electric dirt bike for kids that took the market by storm since it was first released back in 2005. 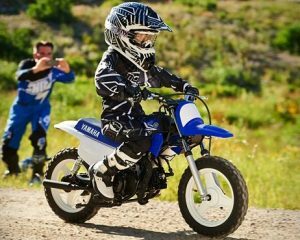 We are not surprised as it’s the best value for money when it comes to introductory kids pit bikes. Along with a similar MX400, it’s a perfect entry-level dirt bike for five to eight-year-olds. MX350 has dimensions of 44 x 24.5 x 31 inches, weighs 70 pounds and features a steel frame, large knobby tires and gear-less, 24V battery-operated electric engine. It speeds up the bike to 14 miles per hour on a paved level surface. 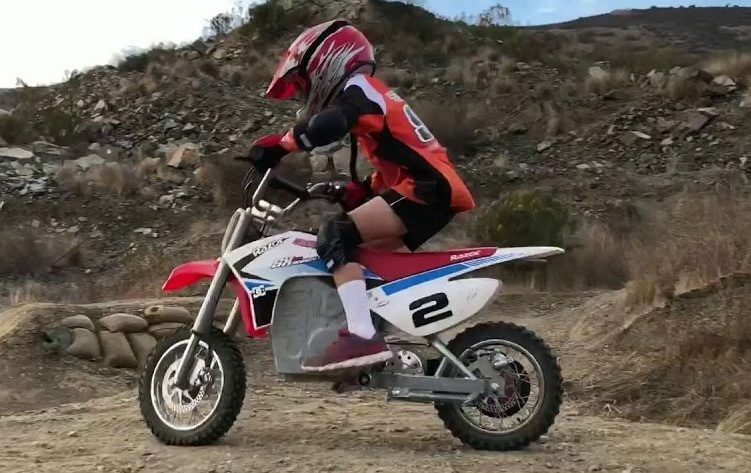 Although Razor rated MX350 as recommended for ages 14 and older, tens of customers reported that due to the low seating position (about 20 inches off the ground,) the MX350 (or MX400) is actually going to be a perfect dirt bike for a 5-year old. The Razor MX-500 are quality, high-performance dirt bikes that provide amazing riding experiences at an affordable price. MX500 is a slightly larger bike (46.5 x 13.8 x 26 inches) featuring large front (16″) and rear (14″) pneumatic tires, and a 500W electric motor which is enough to carry young riders at respectable speeds of up to 17mph. 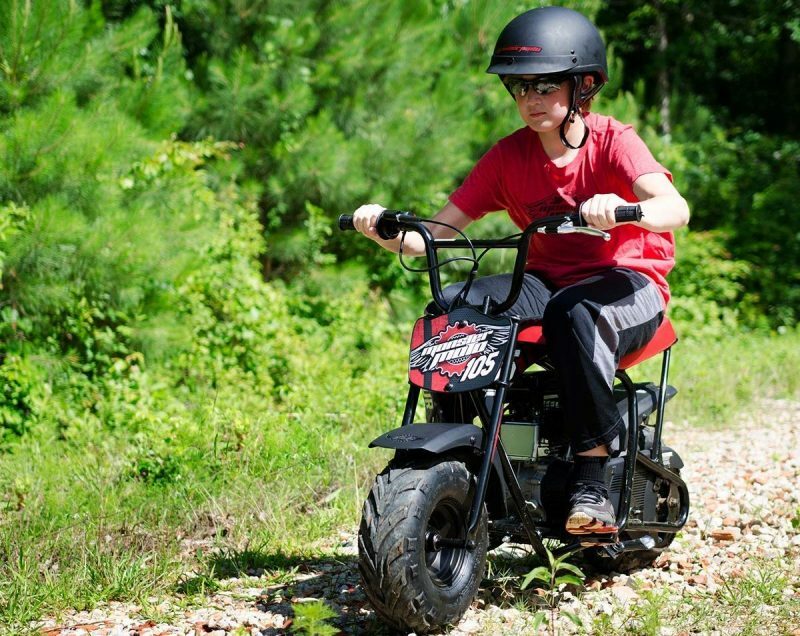 However, perhaps the biggest advantage of the Razor MX500 is that it is very, very quiet, so you can be sure your kids won’t annoy the neighbors when they ride near their property. As your kids grow up, they will need a slightly larger and more powerful bike. Whereas the MX350 is ideal for youngest drivers (5-8) and the MX500 fits kids aged 8-12, the Razor MX650 will be a good pick either for older kids (10+) or more experienced young riders. We think it’s the best dirt bike for 11 year old kids, and many reviews on Amazon tend to confirm this. It doesn’t come by surprise that the manufacturer rates the bike for 16+, as we already noticed Razor tends to add some sort of “extra safety buffer” to their products. However, from our experience and from other customer reviews, even kids that turned 8 or 9 will master this kids dirt bike with ease. It may look like a full-size bike by the pictures but actually, the dimensions are 56 x 24.5 x 36 inches (LxWxH), so it’s definitely the kids’ version. Similarly to other Razor models, this fully electric model is very quiet and provides enough speed and power to guarantee fun and challenge without presenting an unacceptable risk. What really stands out is the suspension. The rear suspension is fully adjustable whereas the front features inverted motocross suspension fork. The Kuberg Trial E is an electric kids dirt bike of the highest quality. It’s more expensive than other mini dirt bikes for kids but on other hand, each and every detail in this bike is a top-notch quality. 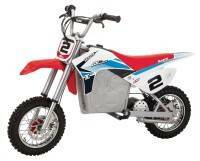 Pit bikes by Kuberg will carry young riders between 5 and 12 years old. Small kids won’t find any trouble in getting on this bike, as the seating’s height is low at 21 inches. 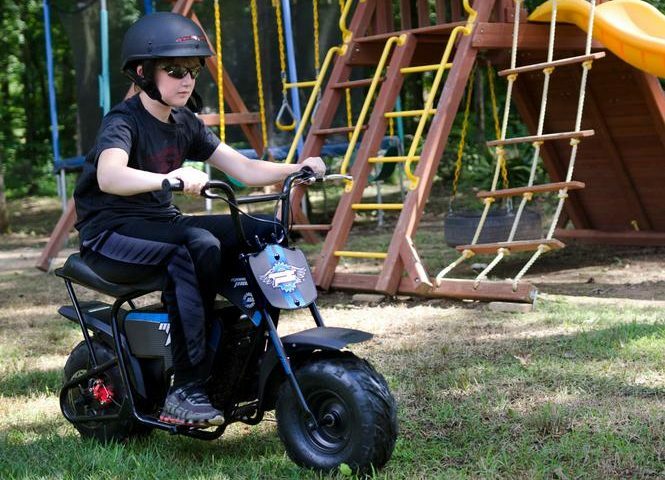 This little beast features the 750W electric motor engine that speeds up to 18 mph. What’s most impressive though is the battery operating time which lasts for more than 2 hours of continuous riding! Another unique feature that we haven’t seen before is the parental speeding control which allows parents to limit the bike’s maximum speed. The Kubert Trial E is essentially a silent bike that allows the fun of backyard riding while keeping peace with the neighbors. Inspired by champion motocross racer Jeremy McGrath, this bike comes with authentic McGrath graphics and fairing design, genuine dirt bike frame geometry and a high torque variable speed motor. The SX500 is an excellent bike for beginners and has top speeds of up to 15 mph. The SX500 (Amazon link) comes equipped with motorcycle spec tires that have front- and rear-specific tread, disc brakes, and dual suspension. The battery is 36V made up of three 12V lead-acid, sealed batteries and can run for up to 40 minutes of continuous use and charges in about 12 hours. This bike has a steel frame, a seat height of 21 inches, adjustable-angle, riser-style handlebars, a double crown fork, and can safely carry a youngster that weighs up to 175 pounds. It’s also sturdy, has excellent power and runs through mud, bumpy terrain, brush, rocks and leaves without any problem. It can power up small hills with ease and gets great traction, even with a couple of inches of snow on the ground. 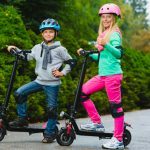 The manufacturer specifies that the bike is for ages 14 and up, but plenty of younger kids can handle it with ease (many user reviews on Amazon confirm this). In our opinion, this is right dirt bike for 9 year old, but of course the range is broader, think of 8-12. In terms of assembly, The SX500 assembles easily in about 15 or 20 minutes and will provide years of riding excitement, and in terms of comparison to other Razor dirt bikes, it’s definitely larger in size than the introductory MX350 model, but a bit smaller than the MX650 (also smaller in power, as here we have 500 Watt engine versus 650 Watt in the MX650). Now it’s time we introduce a gas-powered bike. This bike looks old-school and may remind parents of the mini bikes from back in the day, but this one is safer and more comfortable to ride. The MMB-105, available on Amazon right here, comes with a four-stroke, air-cooled, 105cc overhead valve engine with 3.5 horse power and an automatic, no-shift, centrifugal force clutch that makes it simple to operate. Although it’s not a dirt bike per se, the beefy, powder coated, gusset reinforced, welded steel frame and no-dent polypropylene fenders mean that this bike can take a beating. The bike weighs 78 pounds, has a 23-inch seat height and is 50 inches long. The MMB-105 has a .32-gallon gas tank and a recoil starter. A 35.5-inch wheelbase and 145/70-6 super grip, off-road tubeless pneumatic tires with steel rims are perfect for trail riding. Added suspension for a smoother ride and better performance plus a hand-operated, cable actuated rear disc brake and adjustable handlebars round out the package of this powerful mini bike. The MMB-105 comes about 90% assembled, and the remaining assembly is simple. This mini bike moves fast when it gets up to speed, so a youngster should exercise some throttle control the first time out. The front shocks are great for off-road trails, and the thick tires have no problem handling uneven terrain and crossing small streams. The bike gets excellent gas mileage will last for a lifetime of off-road fun and excitement. Here comes another bike by Mega Moto a.k.a Monster Moto, but this time we’re talking about an electric one. 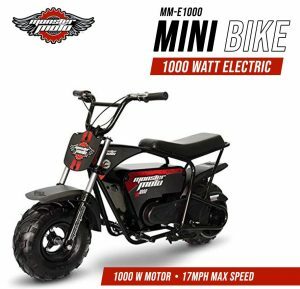 The MM-E1000-BRM has a powerful 1000-watt electric motor that provides plenty of power and torque for off-road trails but is quiet enough for neighborhood use. The bike is simple to set up; attach the handlebars with the included tool kit, charge the battery pack and start it up. This mini bike comes with a powder coated, and gusset reinforced, welded tubular steel frame and no-dent polypropylene fenders. The MM-E1000-BRM is easy to handle with a large, comfortable seat, spring-loaded foot pegs, and a motorcycle-style throttle. The included charger connects directly to the E1000 built-in charger hook up, and the battery pack fully charges in 6 hours for about 45 minutes of riding excitement. There is a useful charge status indicator mounted on the handlebars, so the rider always knows how much juice is left. With a chain guard and power stop button located on the handlebars, this mini bike is very safe to operate. The MM-E1000 is a great starter bike for 7 – 9-year-old kids because it is quite powerful, enough for an exciting off-road ride for kids of this age range, but at the same time not so powerful that the rider might lose control or get scared. It’s also worth to mention that this bike enjoys very good reviews on Amazon, with plenty of 5-star ratings. When it comes to the ride quality, the bike is very comfortable and easily handles off-road bumps, turns, and obstacles. The thick, knobby tires are perfect for bombing around on trails or even the backyard and around the neighborhood. This mini bike looks just like a scaled down version of a true motocross bike. TT250 has a 250-watt motor with a 24V SLA deep cycle battery power system that includes a charge indicator mounted on the handlebars. 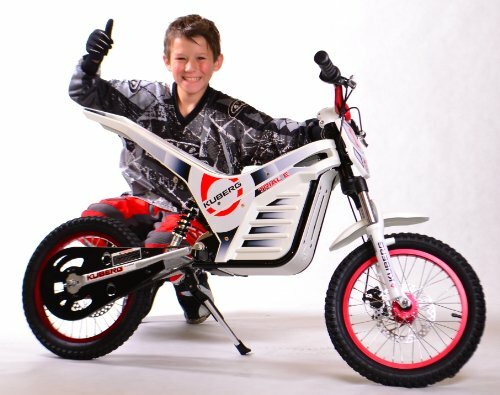 The not-so-powerful electric motor makes it a perfect entry-level bike for kids that are new to dirt bikes. Parents can adjust the speed of the bike, based on the rider’s skill level, with a choice between 7-mph top speed and 14-mph. The TT250 has a heavy duty welded steel tube frame with adjustable mono shock rear suspension and telescopic front forks for a truly smooth ride. Burromax mini bike, which we recently spotted on Amazon, has a 14-mile range and can be recharged in about 8 hours with the included 1.5-amp UL listed charger. Large diameter aluminum alloy wheels with 12.5-inch diameter pneumatic tires, rear disc brakes, a wide seat that is 21 inches high and adjustable handlebars give the TT250 all the comfort and control that a young rider could ask. This bike has smooth acceleration and excellent pickup. The fact that it looks like a real motocross bike and not a toy is a great feature. It is a comfortable bike that is easy to ride and perfect for a young rider that is just starting. The bike is recommended for riders eight years of age and older and has a 250-pound weight limit. If you went through this article then you should already know how to choose the right dirt bike for your child and what are the popular models available on market right now. There’s one more important topic, however, that we left for the end – and that is safety in mini bikes for children. The first consideration regarding safety for kids riding dirt bikes is whether they are physically ready. A youngster should be comfortable getting on and off the bike and holding it up. There should be no problem reaching the brake and gear shift levers, and familiarity with how they function is just as important. Kids must learn all the working mechanics of a bike, such as a starter and a throttle. As far as the right size of dirt bike, a general rule is that a 6- to an 11-year-old child should ride a dirt bike with an engine size of 70 ccs and lower, while 12- to 15-year old kids can ride a bike up to 90 ccs. Always err on the side of caution when deciding on the size of the bike for a kid and do not buy a larger one with the thought that the child will grow into the bike. Proper riding gear is essential for the safety of kids riding dirt bikes. Of course, the most critical piece of equipment is a helmet (we recommend full-face helmet like this one), but it is also a good idea to purchase a protective vest, riding boots and gloves. Make sure that all these items fit snugly and properly because loose-fitting gear is clumsier and can distract the rider. It wouldn’t be a bad idea to look for a complete set, like this popular TCMT set for young off-road riders. Whether a parent has riding experience or not, it never hurts to enroll a child in a dirt bike riding school. The advantage of a riding school is that they will be learning with other kids from a professional and there are none of the emotionally charged interactions that can happen when any parent teaches their child how to do something that can be potentially dangerous. These instructors can also teach them about trail safety and rules, such as not racing their friends on a single-track trail. Different aspects of riding that kids need to learn to ride safely are things like correct riding posture, smooth clutch and throttle control, lower body control, and the right way to turn. 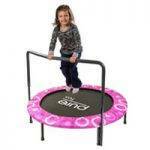 Counterbalancing, riding over obstacles, traversing hills, K-turns and U-turns are essential as well. Kids also need to learn how to maintain a safe distance from other riders and the leading causes of accidents on the trail. Make sure that kids know never to ride alone so that they have another rider around in case of a mishap. Hi! Just looking for advice from parents about dirtbike safety. I purchased an electric model for my 9 year old son. He is a beginner but i think he will do extremely well based on his bike and other skills. What kind of pads besides the helmet would he need? It goes 15 mph and he would ride it on our private street and around our grassy yard, no rocks or funny terrain. Does he need a collar or chest protector? If he would hit a curb or lose control i am worried about injuries. Are regular skateboarding knee and elbow pads ok or should he have “riding pants” ? Please advise! Thank you! Elbow and knee pads are highly recommended. It’s best to get dirt bike / ATV pads, you can find these on Amazon. However, even skateboard gear can provide some protection. If you son is going to ride in the backyard, on grass, that’s a different threat than when riding on the pavement (or any other hard surface9. We always recommend NOT to save on child’s safety. Good helmet, elbow and knee pads, plus some back and/or chest protector – these are all things we’d very seriously recommend. My 9 year old is getting his very first 70cc dirt bike and I’m buying all safety items I can. Helmet, goggles, gloves, chest protector, pants, and boots. You can’t ever be too safe on these motorized bikes as they do go pretty fast! That’s so true! We can’t just stress enough how important the safety gear is and are always recommending buying such. Riding dirt bikes is great fun for the little ones but parents should always act responsibly and invest into their kids’ safety.